I cant do gallery with videos and didnt found documentation about that. I followed instructions from here but doesnt worked. How can I do a mixed gallery into the WP Gallery Extra? Its possible do this keeping my current gallery template? You need to create your gallery just like we showed in this tutorial. Then just insert video URL in the Custom URL field and set the Custom Target field as _video for self-hosted videos or _lightbox for social hosted videos in your WordPress Media Library where you set up photos. And you need to use WP Gallery Extra version 1.2.x or newer. Please update it. Thank you for updating to the latest version! WordPress Gallery Extra 1.1.0 is the most intuitive and extensible gallery management tool ever created for native WordPress Gallery. Download the latest install-able version from CodeCanyon Downloads page and replace the package with your current plugin folder. Activate your license in WP Gallery Extra -> Settings page, then go to Installed Plugins page and click on Check for updates in WP Gallery Extra plugin section. Plugin is already updated! 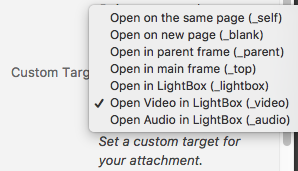 But still doesnt opening videos on lightbox. The videos opening on new tab. I just select the “iLightbox” plugin into the Gallery Extra Template. Another bug appears, but i will open new topic for this.